Island Wide Turns Up The Pressure! Island Wide Pressure Washing started off the new year with the purchase of a brand new F-450 Super Duty Truck, featuring a state-of-the-art - pressure washer mounted unit. This amazing new unit, a KEW Power Washer with an 11hp Honda motor and advanced hot water capacity, enables us to thoroughly clean any surface in a matter of minutes. It also gives our professional technicians increased mobility to work side-by-side with owners in the field. 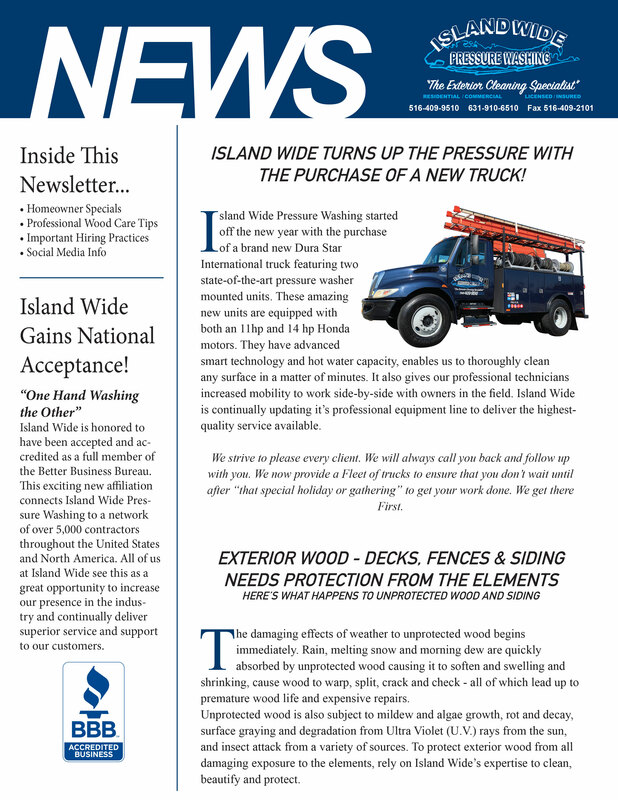 Island Wide is continually updating it&apos;s professional equipment line to deliver the highest quality service available. Masonry Cleaning is Important too! The term masonry encompasses almost all building materials formed with various natural or artificial mineral products Ä stones, bricks, cinder blocks and tiles. Often, mortar or cement is used as a bonding agent on the structure. Experienced power washers and chemical distributors share their experiences cleaning the structural material that builds America -- and the world. While it may appear smooth and impenetrable, the surface of a driveway, sidewalk or a brick or concrete patio is deceptive. The nature of masonry composition is a tricky one it contains minute cracks and crannies. It is here that the dirt builds up from pollution like car exhaust and smokestacks, giving structures an overall dirty appearance. At Island Wide, we are fully capable of handling all your needs. No job is too big or too small. Call today to speak to one of our pressure washing professionals, who can answer all of your questions. JUST GIVE US A CALL, WE&apos;RE GLAD TO HELP YOU OUT! Your questions and inquiries are always welcome at Island Wide Pressure Washing. Please feel free to call us with any concerns you may have regarding your exterior cleaning needs or contracting requirements. We&apos;ll be happy to assist you in any way we can, and we look forward to being of service to you in the near future. The damaging effects of weather to unprotected wood begins immediately. Rain, melting snow, and morning dew are quickly absorbed by unprotected wood causing it to soften and swelling and shrinking, cause wood to warp, split, crack and check - all of which lead up to premature wood life and expensive repairs. Unprotected wood is also subject to mildew and algae growth, rot and decay, surface graying and degradation from Ultra Violet (U.V.) rays from the sun, and insect attack from a variety of sources. To protect exterior wood from all damaging exposure to the elements, rely on Island Wide&apos;s expertise to clean beautify and protect. Island Wide Gains National Acceptance! "One Hand Washing the Other"
Island Wide is honored to have been accepted as a full member of the Power Washers of North America (PWNA) Association. 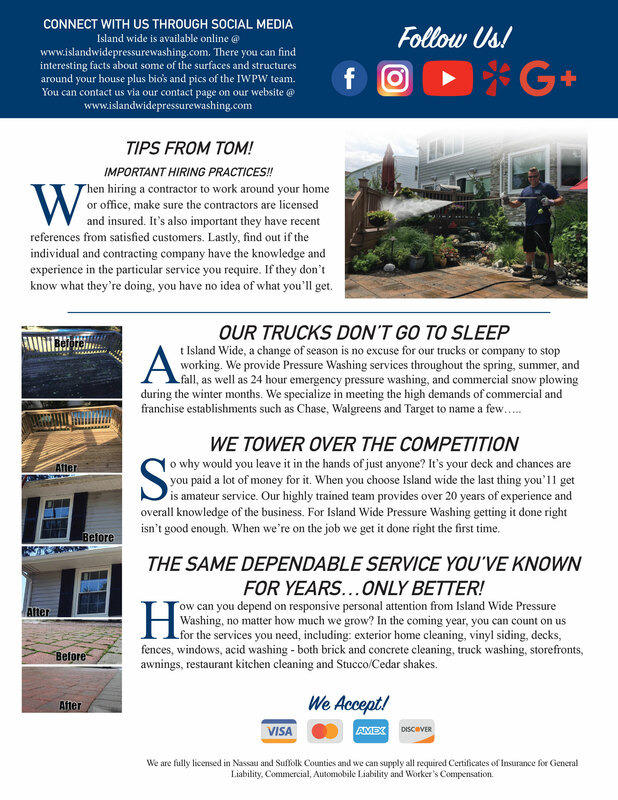 This exciting new affiliation connects Island Wide to a support network of over 400 pressure-washing contractors throughout the United States and Canada. All of us at Island Wide see this as a great opportunity to increase out knowledge of the industry developments and innovations, and continually deliver superior service and support to our customers. First and foremost when hiring a contractor to work around your home or office, make sure the contractors are licensed and insured. 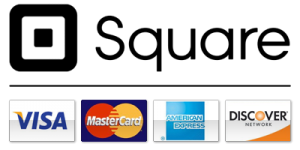 It&apos;s also important they have recent references from satisfied customers. Lastly, find out if the individual and contracting company have the knowledge and experience in the particular service you require. If they don&apos;t know what they&apos;re doing, you have no idea of what you&apos;ll get. 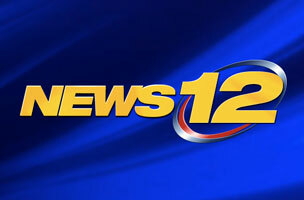 Island Wide Pressure Washing was featured on New 12 Long Island&apos;s Go Green with 12. The feature was also mentioned in Newsday on the same date.Island Wide Pressure Washing uses biodegradable detergent.